COLOMBO • Foreign aid began arriving in Sri Lanka yesterday, bringing help to half a million people forced out of their homes by heavy rains and landslides that killed at least 71 in a week of extreme weather wreaking havoc in South Asia. As the heaviest rains in a quarter of a century battered Sri Lanka, Cyclone Roanu barrelled into Bangladesh's coastline, leaving at least 20 people dead and forcing the evacuation of 500,000 there as it unleashed winds as strong as 88kmh and heavy downpours. Torrential rains have deluged Sri Lanka since last weekend, triggering huge landslides that have buried victims in up to 15m of mud and left 127 people missing. As aid began to arrive yesterday on a military plane from India and a commercial flight from Japan, the Sri Lankan authorities said their priority was preventing diseases such as diarrhoea, with many areas still under water. "We have sent a large number of doctors and nursing staff to ensure there is no outbreak of waterborne diseases," Health Minister Rajitha Senaratne said. In Colombo, residents clung to ropes as they battled to cross torrents of water pulsing through the streets of the flooded capital, with some forced to take shelter in rickshaws. The Indian government has provided inflatable boats, outboard motors, diving equipment, medical supplies, electricity generators and sleeping bags, officials said. The first of two Indian naval ships arrived yesterday at the port in Colombo, while Australia and the United States have made cash donations to help victims. Floodwaters in parts of the capital subsided slightly overnight, officials said, but heavy downpours yesterday prevented many from moving back to their homes on the banks of the Kelani River. 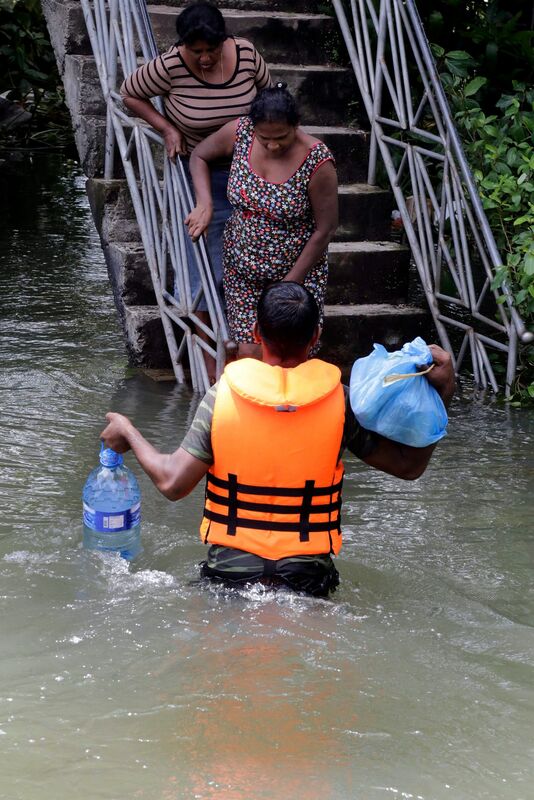 "Colombo did not receive any significant rain last night and the water levels of the Kelani went down slightly," disaster management centre spokesman Pradeep Kodippili said. "But there were showers upstream and we are worried that the water levels can rise again in a day." Nearly 300,000 people were staying in about 500 state-run relief centres yesterday, which also marked the Vesak holiday, while a further 200,000 people were staying with friends or family. Officials said there was a fresh landslide in the worst-hit central district of Kegalle, but no casualties were reported because the area had been evacuated. The country's influential Buddhist clergy urged the faithful to divert at least half of the money for holiday celebrations to help flood victims. "There are lots of people who have lost their homes. Some only have the clothes they are wearing," top Buddhist monk Warakagoda Sri Gnanarathana said. "Consider this your meritorious deed to celebrate Vesak." Vesak celebrations were muted yesterday in Colombo compared with previous years when the entire city would be decorated with lanterns and coloured lights. President Maithripala Sirisena called on Sri Lankans to provide shelter and to donate cash or food to flood victims. Accommodation-booking website Airbnb listed at least 29 places offering free lodging for anyone affected by the floods in Sri Lanka. The meteorological department said the rains were caused by a depression in the Bay of Bengal ahead of the arrival of the south-west monsoon.